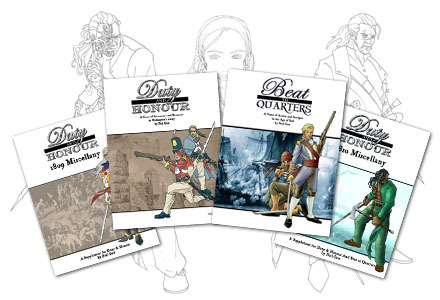 The Empire series of books takes you on roleplaying adventures in the age of Napoleon! 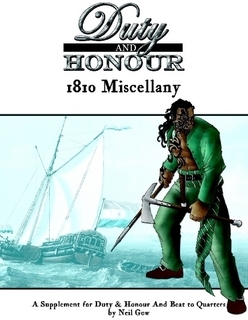 Inspired by the Sharpe and Hornblower books and TV series, players take the roles of a small band of British solders (in Duty and Honour) or a ship’s company (in Beat to Quarters) and … well, take the battle to the French! 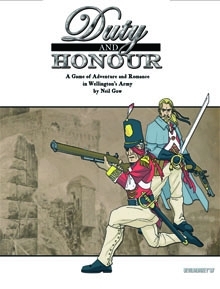 Both games use a simple to learn playing card mechanic that resolves each outcome in a single flurry of card flopping that brings real tension to the table, and a mission system that blends GM-driven military plots with player-driven character plots and uses both to seed the game play with inspiration. 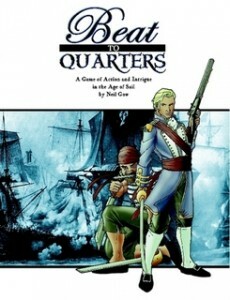 Rules for creating your character and your group’s regiment. Combat, both single and massed! 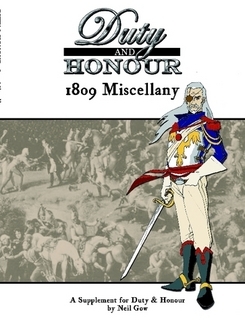 Cheat’s guides to regiments and period names. Rules for creating your character and your group’s ship. Cheat’s guides to ship and period names, nautical phrases and ship parts! Scoundrel enemies from within your own ranks! Spanish characters! Adding guerillas! Priests! …. women! Additional rules for curios, class, previous experience and newspapers! The sights and sounds of Georgian London! Seven despicable enemies for both games – Utter Bastards! Rescue the Lady – an adventure using both D&H and BtQ characters with whom you may be passingly familiar….